Inspired by the Delaware Art Museum’s collection of Pre-Raphaelite Art, artist collaborators Troy Richards and Knut Hybinette developed the Museum’s first virtual reality (VR) experience. 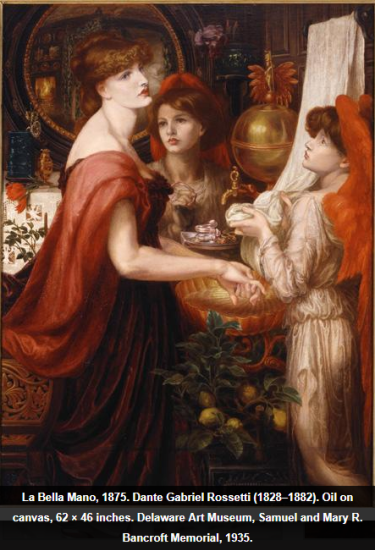 The artists re-imagined the world inside the richly layered Victorian painting La Bella Mano by Dante Gabriel Rossetti. La Bella Mano (1875) features three female figures in a Victorian-era home with a circular mirror that reflects an adjacent room. The seeing glass, on view November 18, 2017-January 14, 2018 in the Museum’s Pre-Raphaelite galleries, transforms the painting into a three-dimensional waking dream with lavish décor and decaying displays of flowers, fruit, insects, and skulls. La Bella Mano is an example of the ‘art for art’s sake’ concept where a work of art becomes a multi-sensory experience instead of relating a specific story. Like the painting La Bella Mano, there is no linear narrative to the seeing glass. Instead, the viewer is absorbed in the virtual world with the possibility of finding meaning in the symbolism of its objects. The symbols do not add up to a specific message but instead allude to ideas, making connections to historical still life painting and the concept of momento mori–a warning or reminder of death. 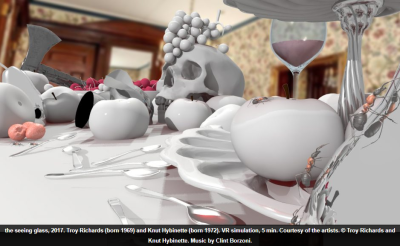 The VR artwork uses the Unreal Engine, a highly successful gaming program developed by Epic Games, and will be installed directly in the Pre-Raphaelite galleries. Once inside the gallery, the viewer will be guided to put on the VR Oculus Rift headset and will initially find themselves in a Victorian-era room, filled with ornate furniture, potted plants, and elaborate wallpaper. Soft music and a breeze stir the air in the background and occasionally there are sounds of movement as though someone else were in the room. The seeing glass is a timed-entry viewing experience. Timed appointments can be scheduled onsite at the front desk the day of a visit for one person at a time.